The USFA released a document on March 28, 2008 with their position on residential fire sprinklers and the benefit they would provide citizens. Below is just a small portion of this document. “It is the position of the U.S. Fire Administration that all citizens should be protected against death, injury, and property loss resulting from fire in their residence. All homes should be equipped with both smoke alarms and automatic fire sprinklers, and all families should have and practice an emergency escape plan. The USFA fully supports all efforts to reduce the tragic toll of fire losses in this nation, including the proposed changes to the International Residential Code that would require automatic sprinklers in all new residential construction.” To read the entire document released, click USFA Position Paper. For more information and to watch their video on residential sprinklers, visit their website. 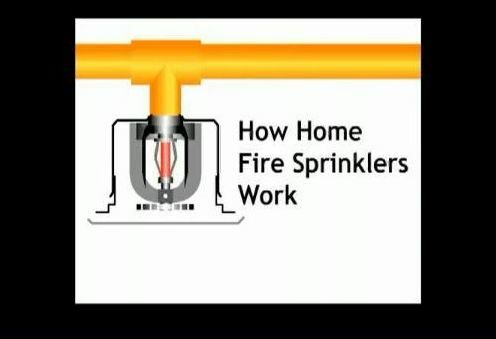 Living with Sprinklers is a video provided by the nonprofit Home Fire Sprinkler Coalition (HFSC). demonstrates the dramatic difference a home fire sprinkler can make. Home fire sprinklers are technologically very advanced, but the basic way they work is very simple. temperature. Here is a short animated movie that explains the workings of home fire sprinklers. Resources, tools and information for community local officials on the life-saving benefits of home fire sprinklers.